I wanted to like tumblr. I really did. But their drafting system is too complicated for me. Why wouldn’t it just save? WordPress has spoiled me. And the lack of internet ability in my apartment has me yelling into my machine and blaring Ty Segall records while I lay under the covers, trying to figure out a way to fix this. WordPress seems to be the only way. Let me start from the beginning. This morning I was enjoying the normal french press of coffee I drink on weekends plowing through Elizabeth Wurtzel’s life in “Prozac Nation” when all of a sudden my weirder-by-the-day neighbor started playing a song. I couldn’t ignore it. Worse, I couldn’t place it anywhere. I took to Google trying to figure out where it was I had heard this song a million times before. And then there it was. This makes me think about my entire life. I can playback this scene not only because I’ve watched that movie too many times on TV and I can tell you that it is, in fact, cerulean blue, because I remember the details. But because when I saw this, I knew the exact feelings everyone in this scene was feeling. I started to remember where I started and how I’ve ended up here. I remember when we had a Magic Potion signed poster on the wall in our station. I remember when Ra Ra Riot was just a band from Syracuse that no one cared about, and we played their music because hey! they’re from Syracuse. I remember when “40 Day Dream” came out and how our tiny internet only radio station that I music-directed played it. And that our FM sister station played it. They played it all the time and then it was everywhere, requests, countdowns and all. I remember when Sigh No More came out and our music director told me that it was truly great. That this band would be everywhere. I remember our music director. His assistant-then-girlfriend cut his big wavy curly hair into weird shapes and sizes one day. That he wore strange sweaters and proclaimed that the world would one day survive only on fruits and vegetables. He was from Seattle, played the saxophone and lent me his hard drive where I found every release from The Go! Team ever. He was voted by CMJ two years in a row as Music Director of the Year. He got to go to SXSW on the College’s dime “for work” and he was in Facebook in photos with his arm around Craig Finn. He was the nicest guy – and still is. (His band Tropical Punk is great.) I remember it all so clearly. I especially remember hearing him play this song on his show Eclectic Revolution, thinking that the voice was so strange, especially with the piano plunks surrounding it. Radio is the only thing that’s been consistent in my life since I was 18. I’ve been getting “paid” to make “radio” since then too. All of this makes me think about the trickle down effect and the recent twitter conversation I had with Emily White. I was questioning why anyone needs to care about Pitchfork’s Best New Reissue (they have since told us that – DUH – Ram is a great record and that people still, I don’t know why, care about Fleetwood Mac.) She reminded me that kids in high school might need it as a reference one day. She then, again, reminded me to question people in music now and their past involvement with Rolling Stone (which reminds me, we should all start calling it “the Rolling Stone history of music.”) It just makes me think that Pitchfork IS the new Rolling Stone. The tastemaker decided by people who sit in offices and listen to music and write about them. They tell us that the new My Bloody Valentine can and should complete the universe. 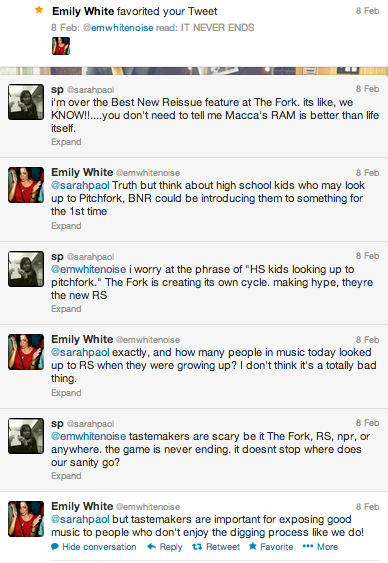 Actually, it’s been so long I can’t remember how long it’s been that I’ve read an entire record review on The Fork. I’m not sure why I can’t anymore, maybe I just got sick of it or I’d rather follow @PitchforkMe on twitter and laugh-cringe at all the prose they’re trying to throw at us while also not-so-shyly snickering at us. Or maybe it’s because I’ve already fallen victim to another kind of hype machine, so why add one more? Emily then reminded me that we need, and always have?, needed tastemakers to help people discover music. We need to tell people what to like because people are too lazy to go looking for it themselves anymore. People use Pandora and Rdio and Spotify and Youtube like it’s their only means. They rely on crappy FM radio – and worse – to tell them what they should be listening to. They complain when they don’t know who Arcade Fire is and when Justin Bieber isn’t nominated for a Grammy. They accept that Chris Brown is going to beat Rihanna and they accept that Rihanna doesn’t care what anyone thinks – even as she’s a tastemaker herself and continues to allow, date, work with and ignore the problems of domestic violence. If everyone is too lazy and we will always have NPR and Rolling Stone and Pitchfork and SPIN and Stereogum and Noisey and our Weeklys and blogs and everything. We will always have someone new to root for and someone else to leave behind. And it has me asking, then what’s the point? What’s the point of loading logs a few days in advance? What’s the point of a new record release so everyone and their mother can write about it telling us what they think? Good or bad – mostly good, when or where do we ever find “bad” “reviews” anymore? I think, What’s The Point? And IT NEVER ENDS. It just simply….never.ends. Where does that leave me? With Edward Sharpe & The Magnetic Zeros’ “Home” stuck in my head? It leaves me wishing there was nothing but silence so my brain would stop thinking about the trickle down effect – what I listen to, what you listen to and how we all talk about it, coverage and all. Media never stops and it never ends. But the catch is, not everything is as valuable as we think. If we really do live in a disposable world where the next feed is just minutes away and who cares what’s trending next, then why do we care in the moment? Why does Stereogum have to publish articles defending Mumford & Sons? Have we forgotten that people start a band to not only share their music with the world but also to make money and pay their bills so they don’t have to have a “real job”? Why do we write off the Black Keys when their music is in Cadillac commercial after Victoria’s Secret commercial? And why is Bob Lefsetz calling Beyonce’s Super Bowl Halftime Show a travesty of American music? There will always be fans and there will always be haters. It’s the case. There is more content to turn over than there are days in the year. I can’t live without it and neither can you. The gatekeepers make their living off it. But if we are our own gatekeepers and don’t need someone to make our taste, we might all have a little more power to decide what we like and who we listen to, instead of who’s twitter beef was bigger than someone else’s self-released EP. I don’t know where this leaves me. Maybe it’s that quarter-year-life-crisis I’ve heard so much about. Or maybe it’s something bigger.